When I think about my collection, I mostly think of the 18th scale cars I collect, and the handful of 64th scale that have managed to survive my childhood. But I sometimes forget I have yet another scale in my collection. Back before my old job got all bothered by employees personalizing their workspace, I had a small collection of 1/43 scale cars. 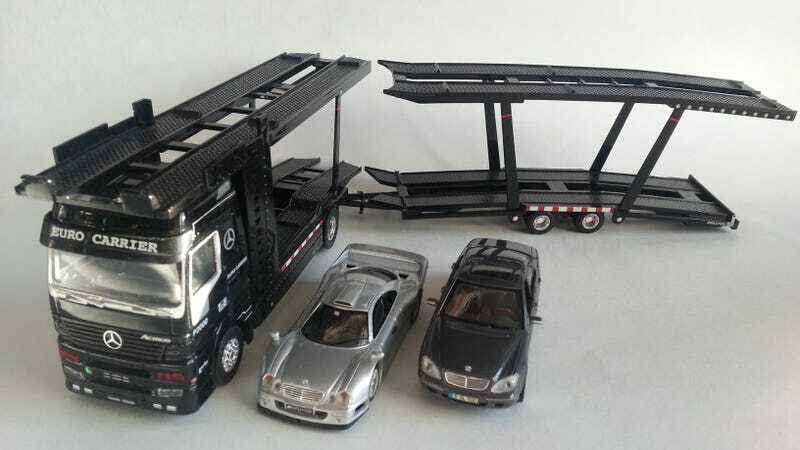 And for Tuetonic Tuesday, I present 3 of them from Mercedes Benz; the Mercedes Actros car transporter by Schuco, and the Mercedes S-class and CLK GTR by Maisto. The 43rd scale has been tempting me for some time now. They're big enough to have some decent (and sometimes crazy) detail, but still small enough to where you don't need an entire room to display 50 cars. And this Maisto S-Class represents that perfect trade-off pretty well. Though it is a far cry from the best the scale has to offer, it's not far from their own 1/18 scale version of the same car, save for the working features. Not bad for something you can scoop up for about $10. And everything said about the S-Class applies to the CLK GTR. I couldn't get a good picture of it, but one nice feature is the plaid inserts on the seats. Now on to the monster Actros. Billed as 1/43 scale, the model is actually closer to 1/39. Detail wise, it's nothing to write home about, but it made an excellent way to display the 7 or 8 cars I kept at work. The trailer is removable, and the top level can be tilted to facilitate car loading, but it's a bit finicky in operation.